Entrepreneurs are leading the way in American philanthropy, according to a recently published study by Fidelity Charitable. The research we conducted led to insights on the qualities and approaches that set entrepreneurs apart in their philanthropy. 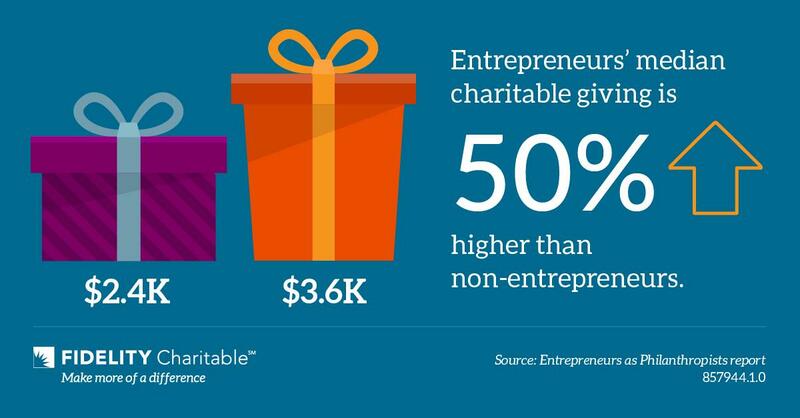 Outsized impact: Entrepreneurs donate 50% more than others, and they volunteer more hours. Philanthropy as identity: Nearly half of entrepreneurs consider themselves philanthropists, compared with less than a third of non-entrepreneurs. Unique approaches: Entrepreneurs are more personally involved in their giving than non-entrepreneurs. Financially savvy philanthropy: Entrepreneurs are more likely to discuss their giving with advisors and are more likely to leave a charitable legacy gift than non-entrepreneurs. Planning for the future: Of the entrepreneurs that are considering near-future exits to their businesses, 69% hope to incorporate charitable giving into their exit plans. We conducted this survey among 3,000 adults in the U.S., including 708 current or former business owners, this year. Learn more by reviewing the study’s landing page (which includes a handful of compelling case studies on entrepreneurs’ philanthropy), key insights, the press release, and the entire report [PDF]. Our past research for Fidelity Charitable includes the ‘Overcoming Barriers to Giving’ study and the ‘Women and Giving’ study.